Carrier Vibrating Equipment - Jim Robbins & Associates, Inc.
Vibrating fluid bed dryers work by passing a heated or cooled gas through a bed of solid particles, with added vibrations helping to fluidize and move the particles in a plug flow. Carrier’s fluid bed dryer systems blows a heated or cooled gas directly through a bed of particles, with a specially perforated plate causing the particles to gently lift and fluidize. 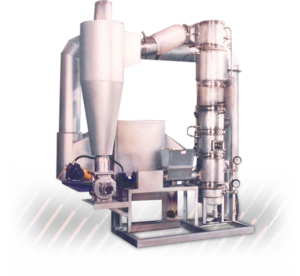 The compact and efficient design is cost-effective for drying super fine powders from a liquid slurry or wet grinding operations without mixing or atomization or agglomeration. A Tornesh dryer uses hot air to dry and elevate wet powders by using a spinning airflow to increase the residence time product spends in the dryer. High speed, high temperature drying gas is blown into a duct where wet material is continuously fed, moving the material through the airstream for a short retention time, drying the material until it is separated from the exhaust gas. Carrier’s vibrating feeders are the most effective and efficient method of conveying bulk materials, with an easy way to control product feed rate. Feeders can convey up to 60 feet per minute and can be designed for high temperature, sticky, heavy, or otherwise hard to dispense products. Carrier vibrating conveyors can cool, scalp, screen, quench, dewater, orient, separate, distribute or be multifunctional, with lengths up to 400 feet and the ability to handle high temperature materials. Vibrating spiral elevators are a useful unit for elevating small to medium size products while only taking up a small footprint. The spiral elevators can also process the product while elevating, with the ability to dry, cool, heat or otherwise process. Vibrating screeners are designed to screen, scalp, dewater, or separate materials based on size using a diverse variety of screens. Carrier’s screeners can have up to five separate screening decks on a single unit and can process up to 1,500 tons per hour while staying economical and efficient. Storage bins often suffer from material flow issues, and a vibrating bin discharger helps keep material from packing or settling, and keeps it discharging on a first-in first-out basis. Carrier vibrating fluid bed sand coolers are specially designed to cool hot return sand down to temperatures and moistures perfect for mulling. The use of patented fluidizing drilled decks and hood designs evenly distribute air and prevent pluggage, maximizing thermal efficiencies. Carrier’s coal dryers use vibration to help with the fluidization of wet or sticky coal, which additionally helps move larger coal pieces that may not fluidize well or typically tend to settle to the bottom of a coal dryer. 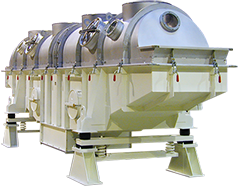 To meet the demands of the industry, Carrier has developed a line of highly efficient dryers/coolers specifically for sand and aggregates that utilize a single high temperature, recirculation of exhaust air, insulation, and predictive cooling zones to make use of evaporative cooling. VibroCool coolers cool hot product indirectly by using a liquid cooling media circulated through tubes immersed in a vibratory bed of product. This design cools product without needing to pass air through the product, eliminating the need for exhaust fans, ductwork, or dust collection. Carrier offers a complete line of vibrating, conveying, screening, drying and cooling equipment specially designed for the needs of the recycling industry. Applications include metal scrap, glass, plastic and rubber, C&D, UBC and more. Carrier’s heavy-duty feeders are designed for constant operation while providing a safe and precise way to feed cupolas and induction furnaces. Carrier’s proven low maintenance design quickly and efficiently flattens bottom heavy or irregular shaped bags while conveying them to a palletizing area. Quenching conveyors continuously and safely process quenched glass from a basement to a furnace, eliminating many industry challenges by using incorporated water pools and dewatering ramps.